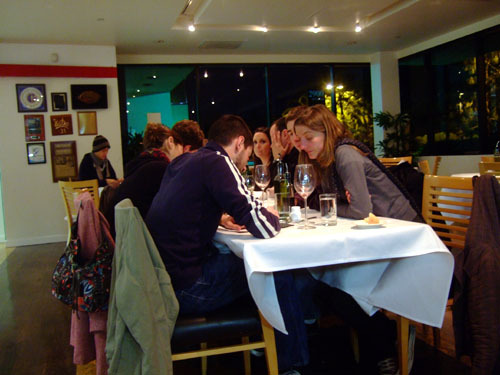 Opened in January 2000, Bistro 31 (named after its location on 31st St) is run by students of The International Culinary School at The Art Institute of California-Los Angeles. 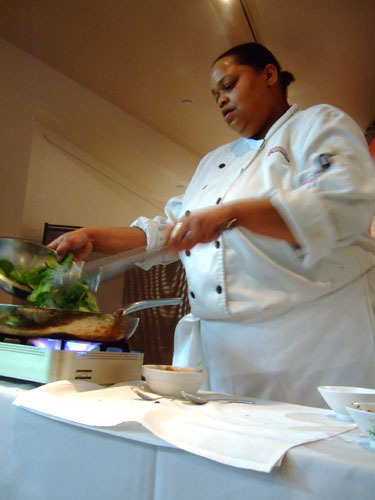 The purpose of the restaurant is to give students real world restuarant experience, to better prepare them for future employment in the industry. 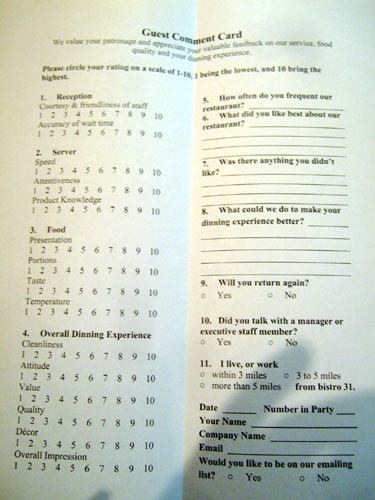 All students participate in running the Bistro as a working classroom, applying skills acquired throughout their study. This means rotating through both front-of-the-house and back-of-the-house positions, though most students seem to prefer working in the kitchen. My road to Bistro 31 began with an email from Culinary Management student and Ortolan line cook Michael Cherney, who invited me to a complementary meal, the goal of which was to provide the students with one of the most important and vexing situations a restaurant can face: a review. The ambiance is a bit spartan, but comfortable. 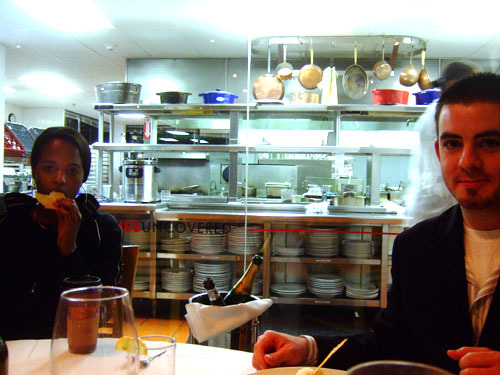 I arrived around 15 minutes early, and was promptly seated by Maître d' Alexandre Rehbinder at the best seat in the house, with an unobstructed view of the bustling kitchen. 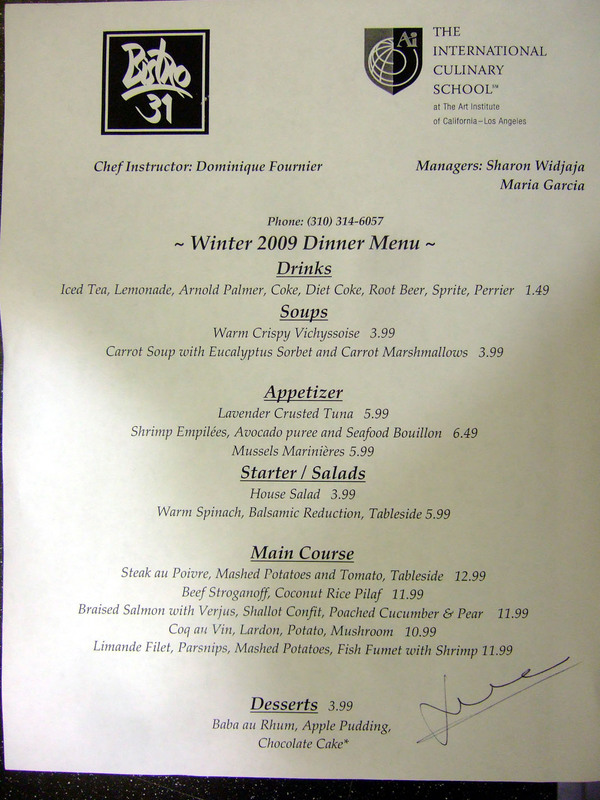 The night's menu is shown above; click for a larger version. As we can see, the menu is compact (apparently the lunch menu is more expansive) and very reasonably priced. Note the signature of Dominique Fournier, Chef Instructor and alumnus of Michel Richard's acclaimed Citronelle restaurant in Washington DC. Though it didn't look like much, the house-made bread was lovely, better than the bread at many Michelin-starred establishments in fact! It had a lingering, salty tang to it that was positively intriguing, and which went beautifully with the subtly sweet butter. Bistro 31 lacks a liquor license, so it's BYOB all the way, an especially attractive proposition given the $0 corkage. 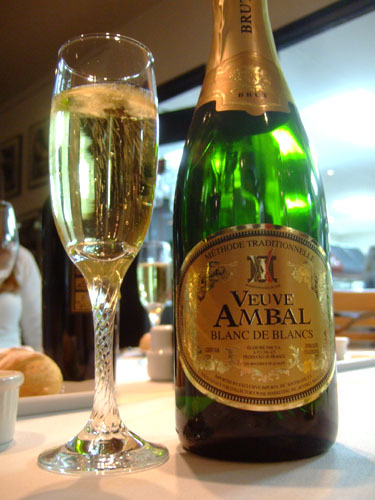 We started with a bottle of the Veuve Ambal Blanc de Blancs Brut, a nice vin mousseux from France. It was a simple but tasty wine, with a floral, honeyed nose, leading to plenty of stone fruit and citrus on the palate. Quite sweet for a brut in my opinion, but good. 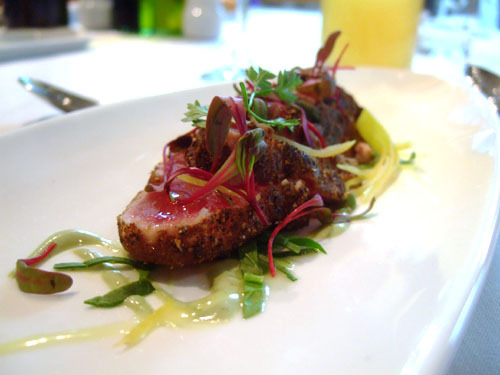 Seared tuna is always a safe bet, and this was no exception. The fish's peppery exterior hit me first, followed by the tuna's soft, mild sweetness and zest of the various accoutrements. The combo worked flavor-wise; unfortunately, the dish was marred by tendon that wasn't removed, leading to a tough, chewy texture on certain parts of the fish. I've found that mussels can be hit-or-miss. Fortunately, this was more on the hit side. 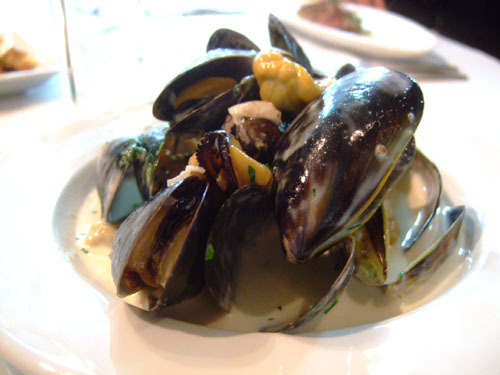 I enjoyed the rich, buttery white wine sauce, which lent a delicious flavor to the mollusks, but which still let their natural, briny flavor shine through. If I had one nit, it'd have to be the texture again. 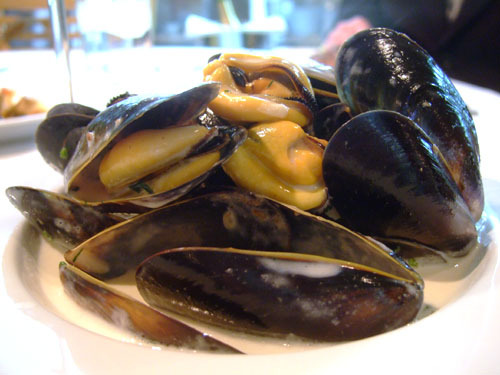 Though the mussels' consistency wasn't problematic, they could've been a touch crisper and livelier. 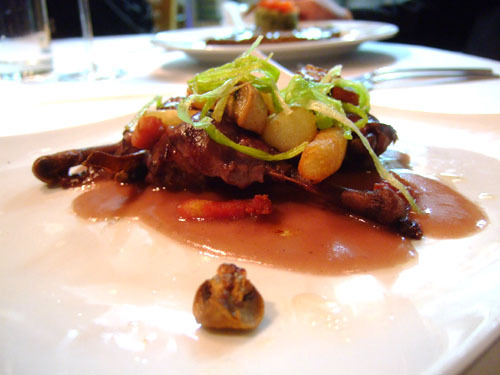 The "empilées" here refers to the "stacked" presentation of the dish. 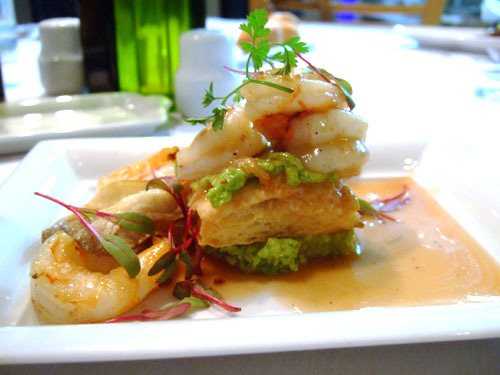 My favorite of the appetizers, the shrimp's mild saltiness worked well with the creamy tanginess of the avocado purée, which was basically like a guacamole. 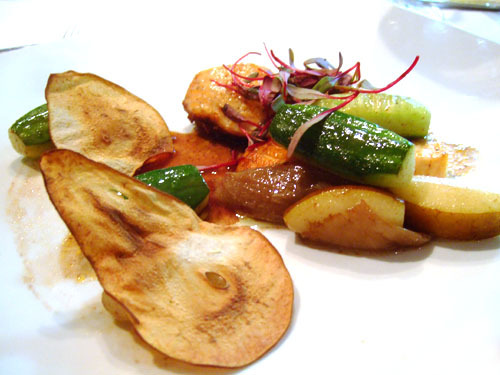 The puff pastry also added an interesting textural element that tied the dish together. The menu has a couple of dishes with tableside preparation, which is becoming rarer and rarer these days. 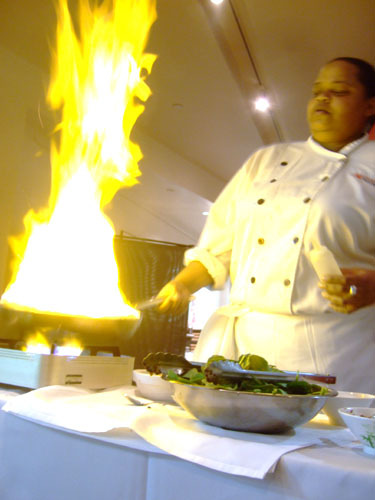 Here, we see the Warm Spinach Salad with Balsamic Reduction [$5.99] being flambéed. Quite a show! 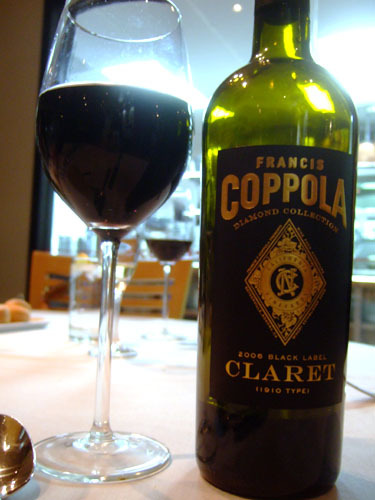 For the main courses, we opened a bottle of the 2006 Francis Coppola Black Label Claret. A particularly dark Bordeaux blend, this showed flavors of cassis, cherry, and smoke, with medium tannins and some vegetal notes coming into play later on. Good with the heavier dishes of the night. 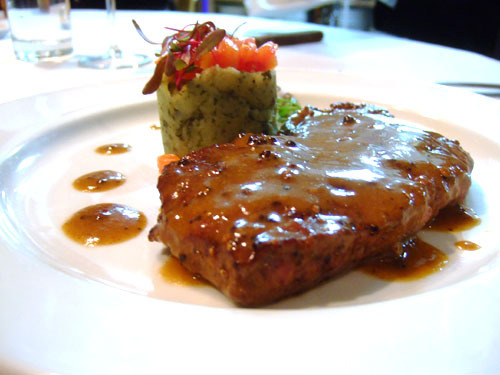 Perhaps the most classic of steak preparations, steak au poivre ("pepper steak") is a French method that basically requires cooking the meat with a coating of peppercorns. This was Michael's entrée, and he seemed to enjoy it. 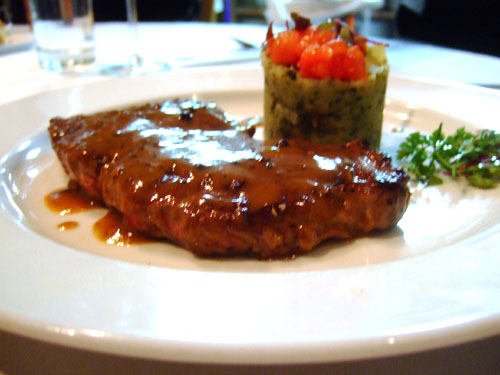 I was able to sample a small piece of the steak, and founded it competently cooked, medium rare, with a strong peppery taste, perhaps too much so actually. 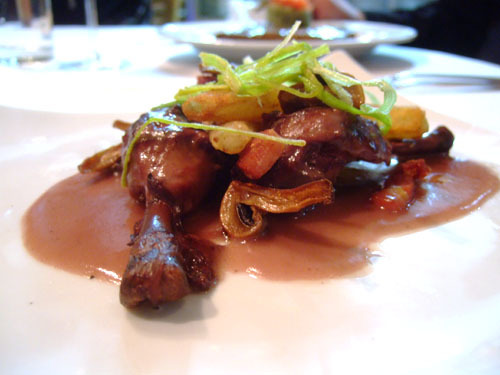 Another very traditional French dish, coq au vin ("rooster in wine") is a stewed dish of chicken with wine, lardons, and mushrooms, along with potatoes and other vegetables in this case. The cooking method resulted in a very flavorful, very tender preparation of chicken, though I didn't try enough of it to make a definitive judgment. Moving away from France, beef stroganoff is a dish of Russian descent--basically sautéed beef served in a sour cream-based sauce. 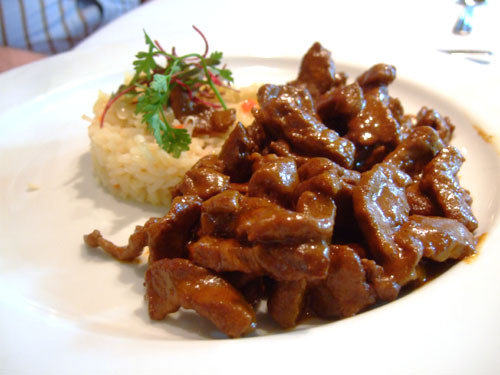 Though contemporary versions often come with mushroom and onion, the beef here was garnished solely with rice. 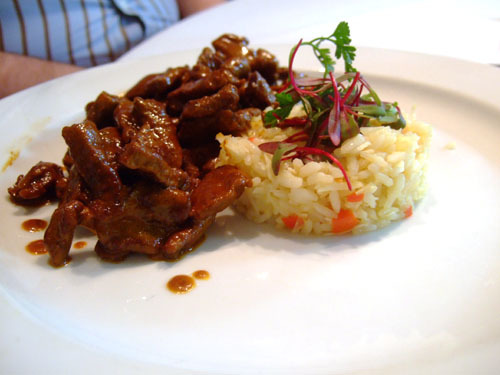 I was able to try a bit of this, and found the beef flavorful, but a bit tough, though nicely tempered by the pilaf. Finally, here was my main course. It was cooked to a just about perfect texture--tender, juicy, and flaky, just the way salmon should be. 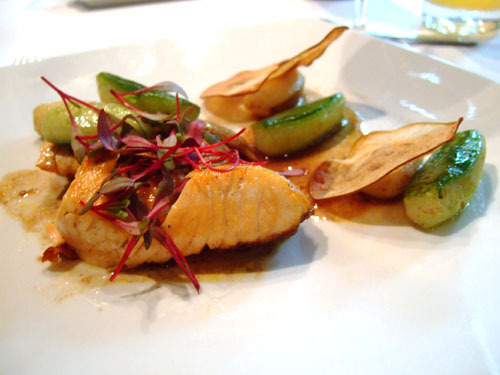 In terms of flavor, the essence of salmon was there but subtle, highlighted by a bit of tang from the verjus. Michael thought that more salt was in order, though I'd lean toward pepper. Meanwhile, the poached cucumber was a great foil to the salmon, but the pear's sweetness threw things off a bit. 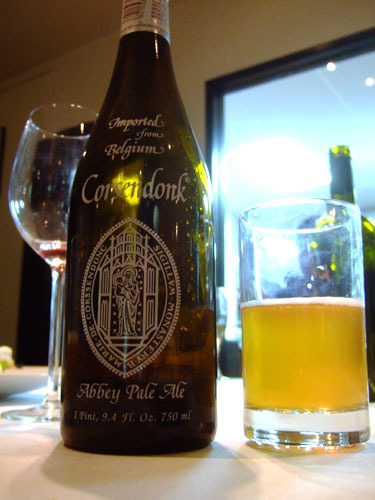 For dessert, we had the Corsendonk Agnus, a Tripel-strength Abbey Pale Ale from Brouwerij Corsendonk in Oud-Turnhout, Belgium (though the beer is actually brewed by Brasserie Du Bocq). Typical of the style, it displayed a nose of fruit and honey, with a taste that was sweet and hoppy, leading to a spicy finish. Light, smooth, very nice. We originally wanted to try the Chocolate Cake on the menu, but we were informed that the kitchen had run out. Thus the first dessert was the apple pudding, which was somewhat like a bread pudding in consistency and taste. Not bad, but I wished there was a more apparent apple flavor. Way too subtle. 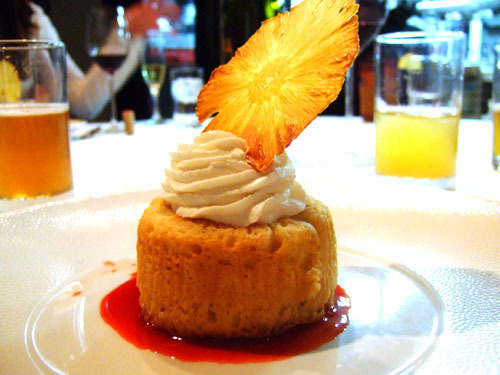 A rum baba is traditional dessert, consisting of a small cake soaked in rum, served with whipped cream. The rum gave the dish an interesting, slightly bitter finish, which was accentuated by the rich sweetness of the cream. We all preferred this to the apple pudding. 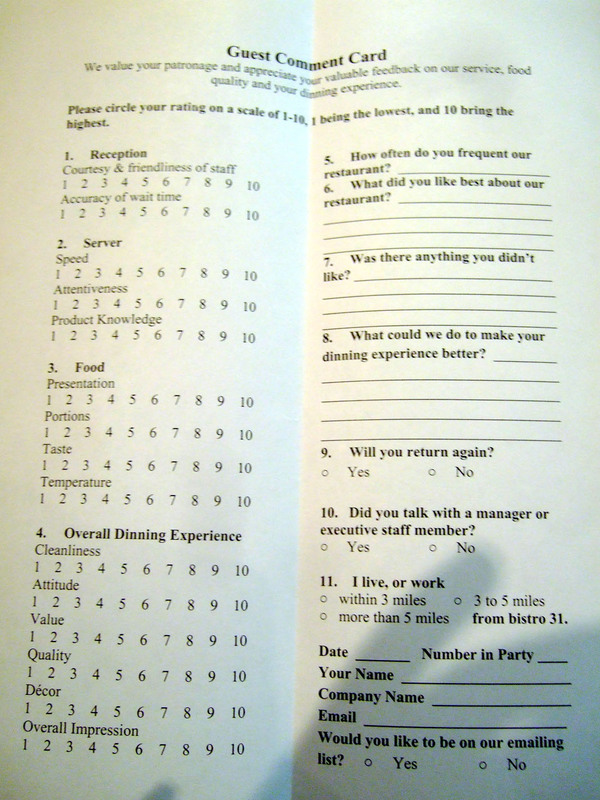 After the meal, I was asked to fill out a comment card, on which I gave mostly high marks. Click for a larger version. 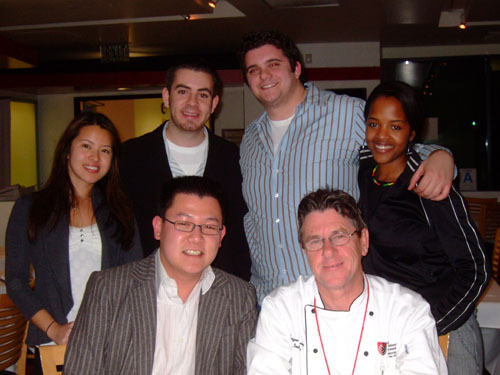 A photo with my hosts, clockwise from lower left: yours truly, Sharon Widjaja (manager), Michael, Max, Dominique, Chef Fournier. I'm happy to say that Bistro 31 exceeded my expectations. 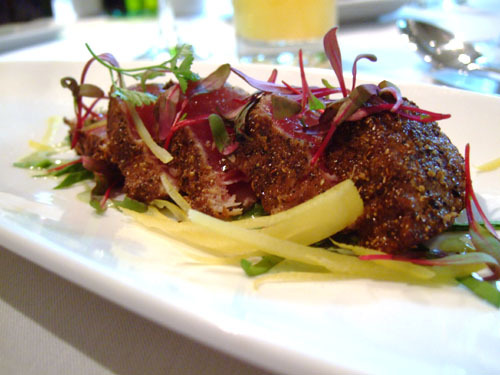 To be sure, the food isn't ground-breaking, but is competently and passionately prepared by a staff that's eager to please. Given that many of the students have never worked in a kitchen before, things begin to look even more impressive. And let's not forget the prices--extraordinarily reasonable given the quality of food--and also the satisfaction that comes with supporting a good cause. If I lived in the area, I imagine I'd be coming back pretty often. 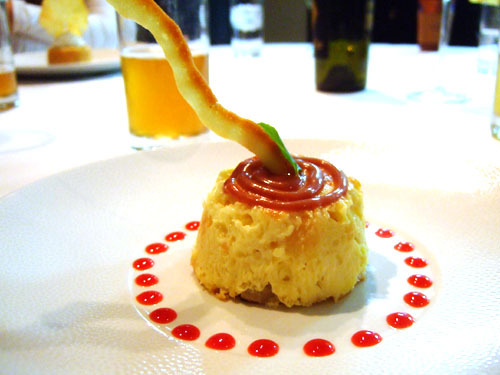 I was just thinking of making a rum baba, this give me a great idea for presentation! I've never heard of Bistro 31 (or poached cucumbers.... YUM). Thanks for another great post. 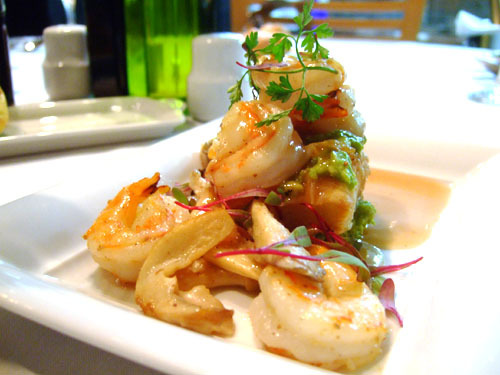 5 Star Foodie: Let us know when you have it up on your blog! MyLastBite: I'd actually never heard of the restaurant either prior to this meal. But it's worth checking out and a nice change of pace as well. It was really the first time I'd been to a student-run place. How are the portions? They look a bit on the small side for the entrees. Yena, I could definitely see how some of the entrées could be a bit smallish, though they weren't completely out of line for "fine dining." But then again, I'm used to very small portions. Nah it's just that picture. I'm 5'10"/165lb, the same as always. I do usually carry a small notepad, or I take voice notes on my camera. Nice post on this place! Maybe we'll check it out if we want something a little whimsical, cheap, and free (in terms of corkage). 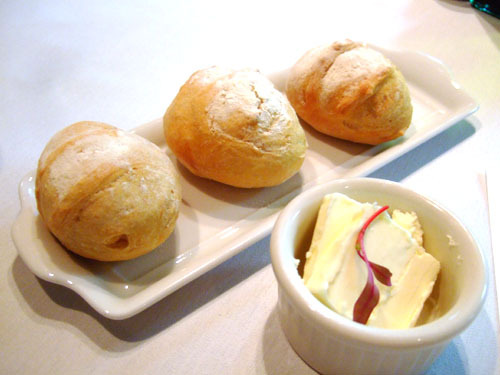 Fiona: I've actually heard pretty good things about Bistro 561. I was thinking about trying it out sometime. No? Matt: "Whimsical, cheap, and free" is a nice description. It's a bit of a change from the norm, and interacting with the students was fun as well. Thank you so much for comming in! I'm glad you enjoyed the food and offered some contructuve critisism!